or Assembly Forces at Very High Speeds? The Signature Technologies SA-2000 “SAM” module, and Signature Technologies “SamView™” Software package can be used to measure the rate of force change versus component displacement of specific features on manufactured parts such as connector parts or small contacts. High speed is a natural for this application. This application can also verify insertion force. Instead of sampling selected parts using an off-line gauging fixture, the illustrated method can perform the same type of test every stroke of the machine so that each part can be individually verified as having the proper dynamic characteristics. FOR EXAMPLE the individual keys on a keyboard could be tested for compliance to a given “feel” specification. The load cell shown with modification can be used in insertions tests for connectors. The system works by compressing, or deflecting the element to be tested with a load cell specifically designed for the purpose. 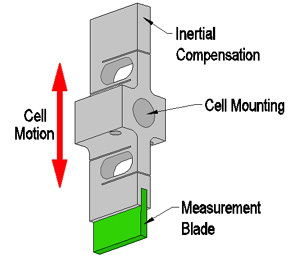 The illustration is of a cell designed to measure the “rate” of spring or flexure components. The load cell is attached to an oscillating mechanism (possibly the forming press slide), and the SAM™ module captures the force information as the test piece is deflected. It can also be used for Insertion / withdrawal force measurements. The measurement can either be calibrated, or comparative depending on the application. Calibrated measurements will give the force vs. flexure displacement of the test piece at the testing point. 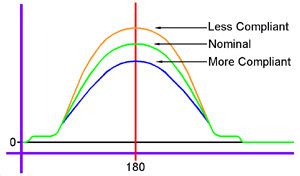 Post processing can be done to supply slope and spring rate information. Inertial compensation is used for high-speed oscillatory service to eliminate inertial forces from the measurement. In slow applications the inertial compensation is not required. Multiple sensors can be used in cases where there are several different features to measure, or where multiple measurements are required to insure proper formation of a single feature. The SAM™ module can handle inputs in groups of 8 up to 56 total points.